Israeli chef Yotam Ottolenghi and his Palestinian business partner and co-chef Sami Tamimi have introduced a love of sumac, shakshuka and za’atar to Western Europe in recent years. Through their London cafés and cookbooks as the ecovatively delicious as Jerusalem, they’ve brought the flavours of their shared homeland to a wider and very appreciative audience. We’re taking inspiration from them this week by making some braised eggs and fragrantly spiced flatbread. This North African dish braises eggs slowly in a sweet tomato sauce. It’s also a great word to say in the morning. Shakshuka! Heat a drizzle of olive oil in a large frying pan (with a lid) over a medium heat. Fry the onion, cumin seeds, garlic and chilli flakes for 3 minutes, until starting to soften. Add the peppers and fry for another 2 minutes before adding the chopped tomatoes. Add the sugar, cayenne pepper, and a good pinch of salt and pepper. Gently simmer for 20 minutes until the tomatoes have softened into a sauce and the peppers still have a bit of bite left to them. Use a spoon to make space for the eggs in the tomato sauce. Break each egg into the sauce carefully. Cover with a lid and cook gently for about 15 minutes, or until the eggs have fully set on top. If they’re looking a bit too wobbly (ours often do – it’s hard to get them right), a five minute blast in a hot oven will finish them off nicely, though it may mean you have to sacrifice your runny yolks. Serve with freshly chopped parsely and crusty bread. Za’atar is one of the most transportive spice mixes out there. One sniff of this sumac, dried herb and sesame mix and you’ll find yourself in the souks of North Africa. Thanks to Ottolenghi and Tamimi, the main ingredient – sumac, a dried, crushed berry – can be found in large supermarkets but try a specialist Middle Eastern shop if you’re having trouble finding it. You can also buy ready-made za’atar but that’s not quite as fun as making your own now, is it? To make the flatbreads, sieve the flour into a large bowl and add the yeast and salt. Mix well before adding 50ml of water. Mix with your hands. Add another 50ml and mix again. Add the last 50ml of water and mix really well in the bowl until a dough ball starts to form. Transfer the dough to floured surface and knead the dough for 5 to 8 minutes until quite smooth. Lightly oil a bowl and put your dough ball into it. Let it rest in a warm place for 30 minutes to let it rise a bit. Cut it into three pieces and roll each into a smaller dough ball, ready to be rolled out and covered with za’atar. Make the za’atar mix by mixing together the . This mix will keep for months stored in an airtight jar and it’s amazing sprinkled on everything from salads to fried eggs to roast meat or fish. 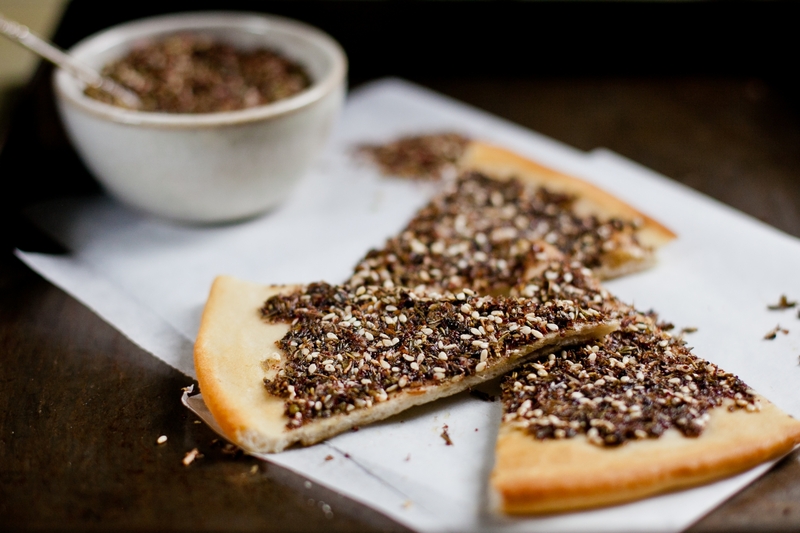 To make a za’atar flatbread topping, however, add your 8 tablespoons of oil to the za’atar mix and combine well. Set aside. Pre-heat your oven to its highest heat. Put sunflower oil on a large baking tray and put it in the oven until it’s good and hot. Cut your flatbread dough into three pieces and roll out into three flat circles. Transfer carefully to your very hot baking tray. Spread the za’atar mix thinly over the bases – about 2 tablespoons of the mix per base should do it. Cook on the middle shelf of the oven for about 8 minutes, until the flatbread is golden and the za’atar is sizzling. Serve as a snack or a side dish. Either way, you WILL eat it all.